Large scale illegal migration from East Pakistan/Bangladesh over several decades has been altering the demographic complexion of this State. It poses a grave threat both to the identity of the Assamese people and to our national security. Successive Governments at the Centre and in the State have not adequately met this challenge. As Governor of Assam, I feel it is my bounden duty,both to the Nation and the State I have sworn to serve, to place before you this report on the dangers arising from the continuing silent demographic invasion. I have also formulated my recommendations for dealing with this issue of vital importance. I earnestly hope that this matter will receivedue consideration and suitable action taken to avert the grave danger that has been building up for some time. The unabated influx of illegal migrants from Bangladesh into Assam and the consequent perceptible change in the demographic pattern of the State, has been a matter of grave concern. It threatens to reduce the Assamese people to a minority in their own State, as happened in Tripura and Sikkim. Illegal migration into Assam was the core issue behind the Assam student movement. It was also the prime contributory factor behind the outbreak of insurgency in the State. Yet we have not made much tangible progress in dealing with this all important issue. There is a tendency to view illegal migration into Assam as a regional matter, affecting only the people of Assam. Its more dangerous dimension of greatly undermining our national security, is ignored. The long cherished design of Greater East Pakistan/Bangladesh, making inroads into the strategic land link of Assam with the rest of the country, can lead to severing the entire land mass of the North East, with all its rich resources, from the rest of the country. This will have disastrous strategic and economic consequences. and statistics on this subject. On this basis, I have formulated my views and recommendations contained in this report. Different aspects connected with the illegal migration have been examined. Recommendations have been made for more effectively arresting the ongoing influx of illegal migrants and taking practical steps to soften the adverse fall outs from the large scale infiltration that has already taken place. economic reasons only but with the approach of Independence, it started developing both communal and political overtones. After Independence, it acquired an international dimension and it now poses a grave threat to our national security. The British developed the tea industry in Assam. They imported labour from Bihar and other provinces to work in the tea gardens. The Assamese people living mostly in Upper Assam and cultivating one crop per year, were not interested in working as labour in the tea gardens nor in increasing or expanding land cultivation to meet the additional requirement of food for the large labour population employed in the tea gardens. Therefore, the British encouraged Bengali Muslim peasants from present Bangladesh to move into Lower Assam for putting virgin land under cultivation. This set in motion a movement pattern which despite changed conditions, has been continuing to this day. When Lord Curzon partitioned erstwhile Bengal Presidency in 1905, Assam was a Chief Commissioner's province. It was merged with the new Muslim majority province of East Bengal. This led to tremendous popular resentment in the country and it ushered political awareness, ultimately culminating in India's Independence. In 1911, the British Government annulled the partition of Bengal. Assam was restored its status as a province and was now placed under a Lieutenant Governor. The Assamese fear of losing their identity and being swamped by Bengalis goes back to this merger and even earlier. This fear had been aroused both by the Bengali Hindus dominating the administration and the professions, and the Bengali Muslims altering the demography of the province. The Bengali Muslims were hard working peasants who occupied vacant land and put virgin areas under cultivation. They made a significant contribution to the agricultural economy of Assam. With Constitutional Reforms, the country started advancing towards democracy, which is a game of numbers. The Muslim League now came up with its demand for Partition, on the basis of religion. This added a new twist to this population movement. During Sir Mohammad Sadulla's Muslim League Ministry, a concerted effort was made to encourage the migration of Bengali Muslims into Assam for political reasons. The Viceroy, Lord Wavell wrote in the Viceroy's Journal, "The chief political problem is the desire of the Muslim Ministers to increase this immigration into the uncultivated Government lands under the slogan of Grow More Food but what they are really after, is Grow More Muslims." When the demand for Partition was raised, it was visualised that Pakistan would comprise Muslim majority provinces in the West and Bang-e-Islam comprising Bengal and Assam, in the East. Mr. Moinul Haque Chowdhary the Private Secretary of Jinnah, who after Independence became a Minister in Assam and later at Delhi, told Jinnah that he would "present Assam to him on a silver platter". Jinnah confidently declared at Guwahati that Assam was in his pocket. The Cabinet Mission Plan placed Assam in Group C with Bengal. Both the Congress High Command and the Muslim League accepted the grouping plan but Lokapriya Gopinath Borodoloi vehemently opposed it. He was supported by Mahatma Gandhi. The grouping plan was foiled and Assam was saved from becoming a part of Pakistan. Partition brought about a sea change in the situation. An international border now separated Assam and East Pakistan. Population movement from East Pakistan continued but it was initially mostly of Hindu refugees, fleeing from religious persecution. Unlike the West, where refugee movement lasted for a few months only, in the case of the East, this spread over several years and is still continuing. Hindu population in East Pakistan started declining steeply. In 1947 it was 27%, by 1971 it got reduced to 14% and by 1991 it was down to 10%. Along with Hindu refugees, Muslim infiltrators continued migrating into Assam for economic reasons. The movement of Hindu refugees into Assam got largely arrested due to anti-Bengali riots and as a result of violence in the wake of insurgency in the State. However, Hindu refugee movement from Bangladesh has continued to Tripura and West Bengal. Illegal migrants from Bangladesh into Assam are now almost exclusively Muslims. Failure to get Assam included in East Pakistan in 1947 remained a source of abiding resentment in that country. Zulfikar Ali Bhutto in his book, Myths of Independence wrote, "It would be wrong to think that Kashmir is the only dispute that divides India and Pakistan, though undoubtedly the most significant. One at least is nearly as important as the Kashmir dispute, that of Assam and some districts of India adjacent to East Pakistan. To these Pakistan has very good claims." Even a pro-India leader like Sheikh Mujibur Rahman in his book, Eastern Pakistan: Its Population and Economics, observed, "Because Eastern Pakistan must have sufficient land for its expansion and because Assam has abundant forests and mineral resources, coal, petroleum etc., Eastern Pakistan must include Assam to be financially and economically strong". Leading intellectuals in Bangladesh have been making out a case for "labansraum" (living space) for their country. Mr. Sadeq Khan, a former diplomat wrote in Holiday of October 18, 1991, "All projections, however, clearly indicate that by the next decade, that is to say by the first decade of the 21st century, Bangladesh will face a serious crisis of labansraum… if consumer benefit is considered to be better served by borderless competitive trade of labour, there is no reason why regional and international co-operation could not be worked out to plan and execute population movements and settlements to avoid critical demographic pressure in pockets of high concentration…. A natural overflow of population pressure is there very much on the cards and will not be restrainable by barbed wire or border patrol measures. The natural trend of population over-flow from Bangladesh is towards the sparsely populated lands in the South East in the Arakan side and of the North East in the Seven Sisters side of the Indian sub-continent". Mr. Abdul Momin, former Foreign Secretary and Bangladesh's first Ambassador to China writing in the same magazine in its issue of November 22, 1991 stated, "The runaway population growth in Bangladesh resulting in suffocating density of population in a territorially small country, presents a nightmarish picture". Urging that along with borderless circulation of goods and commodities there should be borderless competitive trade of labour, he proposed that "if we in Bangladesh ingratiate ourselves with the hill tribes within our borders, our bulging population might find a welcome in adjacent land inhabited by kindred peoples". The views of Jinnah, Zulfikar Ali Bhutto, Sheikh Mujibur Rahman, Sadeq Khan and Abdul Momin have a common thread running through them. No matter how friendly our relations with Bangladesh, we can ill afford to ignore the dangers inherent in demographic invasion from that country. Illegal migration from Assam has been taking place primarily for economic reasons. Bangladesh is the world's most densely populated country with a population density of 969 per square kilometre. The growth rate of population in that country is 2.2 per cent and its population is growing at the rate of 2.8 million per year. Each year nearly one third of Bangladesh gets inundated by floods, displacing 19 million people. 70 million people constituting 60 per cent of the population live below the poverty line. The per capita income in Bangladesh is 170 dollars per year, which is much lower than the per capita income in India. The border between India and Bangladesh is very porous. In these circumstances, the continued large scale population movement from Bangladesh to India, is inevitable, unless effective measures are taken to counter it. Besides the above considerations, there are other contributory factors facilitating infiltration from Bangladesh. Ethnic, linguistic and religious commonality between the illegal migrants and many people on our side of the border, enables them to find shelter. It makes their detection difficult. Some political parties have been encouraging and even helping illegal migration, with a view to building vote banks. These immigrants are hard-working and are prepared to work as cheap labour and domestic for lower remuneration, than the local people. This makes them acceptable. Moreover, with corruption being all pervasive, corrupt officials, are bribed to provide help. Recently, a racket has been busted in Lakhimpur. Four individuals were found to have been providing forged citizenship certificates and other documents to illegal migrants for the last 14 years. There is no evidence of Bangladesh authorities organising the movement of population but they certainly have made no attempts to prevent it and indeed, may be welcoming it, to ease their problem of bursting population. Thus, there is now even an attempt to cover up this movement. Prime Minister Sheikh Haseena has recently asserted that no Bangladeshi is illegally living in India. Illegal migrants have been defined in Assam Accord as those who infiltrated illegally after 24 December 1971. However, the stream that infiltrated illegally between 1 January 1966 and 24 December 1971 was not to be deported and was to be given Indian citizenship after a lapse of ten years. No doubt, Hindus required special consideration at the time of Partition and had to be treated as refugees, but this cannot be allowed to continue for ever. Post - 1971 Hindu illegal migrants cannot justifiably claim refugee status. No census has been carried out to determine the number of these illegal migrants. Precise and authentic figures are not available but on the basis of estimates, extrapolations and various indicators, their number runs into millions. I have quoted the 1931 census report in extensio for three reasons. First, it contains precise figures for migration from Bengal into Assam even when this did not involve any movement across international border. Unfortunately, today we have no census report on the basis of which we can accurately define the contours of trans-border movement. Thus we have to rely on broad estimates of theatrical extrapolations to work out the dimension of illegal migration that has taken place from East Pakistan/Bangladesh. Second, Mr. Mullan described this invasion using military terminology which in present geostrategic context, underscores the strategic aspect of the problem. It is unfortunate that to this day, after half a century of Independence, we have chosen to remain virtually oblivious to the grave danger to our national security arising from this unabated influx of illegal migrants. Third, the prophecy that except in Sibsagar District, the Assamese people will not find themselves at home in Assam, is well on its way to becoming true as reflected by the present demographic pattern of Assam. Shri Indrajit Gupta, the then Home Minister of India stated in the Parliament on 6 May, 1997 that there were 10 million illegal migrants residing in India. Quoting Home Ministry/Intelligence Bureau source, the 10 August 1998 issue of India Today has given the breakdown of these illegal migrants by States - West Bengal 5.4 millions, Assam 4 millions, Tripura 8 millions, Bihar 0.5 million, Maharashtra 0.5 million, Rajasthan 0.5 million and Delhi 0.3 million making a total of 10.83 millions. On 10 April, 1992, Shri Hiteshwar Saikia, the then Chief Minister of Assam stated that there were 3 million Bangladeshi illegal migrants in Assam but two days later, he committed a volt face and declared that there were no illegal migrants in Assam. However, one can see for oneself, the large scale infiltration of Bangladeshis that has taken place into Assam. Looking at the population in the border areas of Assam, sometimes one wonders whether one is in Assam or in Bangladesh. Shri E.N. Rammohan, DG. BSF, who is an IPS officer of Assam cadre, in his report of 10 February, 1997 has stated, "As Additional S.P. in 1968 in Nowgaon, I did not see a single Bangladeshi village in Jagi Road or in Kaziranga. In 1982, when I was posted as DIGP, Northern Range, Tezpur, five new Bangladeshis Muslim villages had come up near Jagi Road and hundreds of families had built up their huts encroaching into the land of the Kaziranga Game Sanctuary". He mentioned that in 1971 the large island of Chawalkhoa comprising 5000 bighas of land was being cultivated by Assamese villagers from Gorukhut and Sanuna and went on the state, "In 1982 when I was posted as DIGP, Tezpur, there was a population of more than 10,000 immigrant Muslims on the island. The pleas of the Assamese villagers to the District Administration to evict those people from the island fell on deaf ears. Any honest young IAS, SDO of Mangaldoi Sub-division who tried to do this, found himself transferred. In 1983 when an election was forced on the people of Assam… the people of the villages living on the banks of the Brahmaputra opposite Chawalkhoa attacked the encroachers on this island, when they found that they had been given voting rights by the Government. It is of interest that Assamese Muslims of Sanuna village attacked the Bengali Muslim encroachers on this island. I am a direct witness to this." Bangladesh census records indicate a reduction of 39 lakhs Hindus between 1971 and 1981 and another 36 lakhs between 1981 and 1989. These 75 lakhs (39+36) Hindus have obviously come into India. Perhaps most of them have come into States other than Assam. into India, as there is little possibility or evidence of there having merged into Bangladesh society. In 1970 the total population of East Pakistan was 7.5 crores but in 1974 it had come down to 7.14 crores. On the basis of 3.1% annual population growth rate of that period, the population in 1974 should have been 7.7 crores. The shortfall of 6 million people can be explained only by large scale migration. There was no census in Assam in 1981. The figures indicated have been worked out on the basis of 1971-91 growth rate. There was no census in Bangladesh in 1971. It was carried out in 1974. The population grew by 40.4% between 1961-74 and another 21.9% during 1974-81. 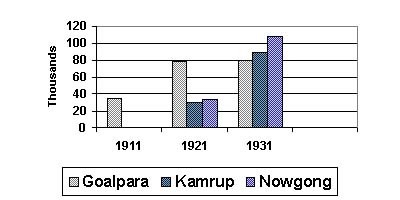 The much higher percentage of growth rate in Assam from 1911 to 1971 over the All India and Bangladesh figures indicate migration into Assam. The All India growth rate for 1921 should be treated as an aberration but even in that decade Assam's growth rate was higher than neighbouring Bengal districts which now constitute Bangladesh. The reduced percentage of growth rates for Assam in 1971-91 presents a distorted picture unless one relates it to community-wise percentage of growth in Assam as compared to All India figures. This is shown at sub-para (c) below. The decadal growth rate for both Hindus and Muslims for the period 1951-61 and 1961-71 was higher than their respective All India growth rate, indicating migration of both communities into Assam. However, during the period 1971-91 Hindu growth rate in Assam was much less than the All India figure. Possibly, this was due to large scale population movement of non-Assamese Hindus out of Assam during the Students movement and subsequent militancy in the State. In the case of Muslims the Assam growth rate was much higher than the All India rate. This suggests continued large scale Muslim illegal migration into Assam. The growth of Muslim population has been emphasised in the previous paragraph to indicate the extent of illegal migration from Bangladesh to Assam because as stated earlier, the illegal migrants coming into India after 1971 have been almost exclusively Muslims. 21. Pakistan's ISI has been active in Bangladesh supporting militant movements in Assam. Muslim militant organisations have mushroomed in Assam and there are reports of some 50 Assamese Muslim youth having gone for training to Afghanistan and Kashmir. The dangerous consequences of large scale illegal migration from Bangladesh, both for the people of Assam and more for the Nation as a whole, need to be emphatically stressed. No misconceived and mistaken notions of secularism should be allowed to come in the way of doing so. As a result of population movement from Bangladesh, the spectre looms large of the indigenous people of Assam being reduced to a minority in their home State. Their cultural survival will be in jeopardy, their political control will be weakened and their employment opportunities will be undermined. This silent and invidious demographic invasion of Assam may result in the loss of the geostrategically vital districts of Lower Assam. The influx of these illegal migrants is turning these districts into a Muslim majority region. It will then only be a matter of time when a demand for their merger with Bangladesh may be made. The rapid growth of international Islamic fundamentalism may provide the driving force for this demand. In this context, it is pertinent that Bangladesh has long discarded secularism and has chosen to become an Islamic State. Loss of Lower Assam will sever the entire land mass of the North East, from the rest of India and the rich natural resources of that region will be lost to the Nation. Assam has 262 km border with Bangladesh out of which 92 km is riverine. In 1947 with the emergence of two dominions on the Sub-Continent, India and Pakistan, this became an international border. For the first few years, unrestricted trans-border movement continued in this sector. Bengali Hindu refugees from East Pakistan fleeing from their homes poured across the border seeking asylum. Concurrently, Bengali Muslims too continued to come across the border for economic reasons. There was also some movement of Muslims from Assam into East Pakistan. Whereas in the West, the trans-border movement of refugees from India to Pakistan and vice versa was a deluge which lasted only a few months, in the East the situation was very different. Hindus from East Pakistan (Bangladesh) kept coming across for many years and indeed they still continue to come. Muslims from Assam going to East Pakistan were relatively in much less number. The traditional influx of Bengali Muslims into Assam continued unabated. The large scale movement of Bengali population, both Hindus and Muslims into Assam, caused considerable resentment among the Assamese people and there were instances of anti-Bengali riots. Initially, the State Police with its limited resources policed this border but they could not stem the trans-border movement. The large influx into Assam was a matter of great concern. Government of India evolved the PIP (Prevention of Infiltration from Pakistan) scheme, which came into operation in 1964. 159 Watch Posts, 15 Patrol Posts and 6 Passport Check Posts were set up. A Police force of 1914 personnel under a DIG was deployed to check infiltration. After the 1965 war, when the Border Security Force came into being, responsibility for guarding the border was taken over by that Force. The Border organisation set up under the PIP scheme was now deployed in the interior to identify and deport illegal migrants. In 1987 this organisation was augmented by 1280 officers and men provided by Government of India and 806 by Government of Assam, making a total of 4000 personnel. Currently, this organisation is functioning under an Additional DG Police of Assam. Neither the BSF on the border nor the Border organisation in the interior, could prevent large scale illegal migration from Bangladesh. The border is very porous and the illegal migrants enjoyed political patronage. Efforts to prevent their ingress or to deport them were not very successful. Nevertheless in the first flush as per JIC Paper No 04/95 of 3 January 1995, 1.5 lakhs illegal migrants were pushed back but many managed to re-enter from different points on the border. There were reports of police excesses and high-handedness, as also allegation of harassment of genuine Indian Muslims. The Chief Election Commissioner, Shri S.L. Shakdher told a conference of State Chief Electoral Officers in 1978, "In one State (Assam), the population in 1971 recorded an increase as high as 34.98 per cent, over the 1961 figures and this increase was attributed to the influx of a very large number of persons from the neighbouring countries. The flux has become a regular feature. percentage, if not the majority of the population of the State. Another disturbing factor in this regard is the demand made by the political parties for the inclusion in the electoral rolls of the names of such migrants who are not Indian citizens, without even questioning and properly determining the citizenship status". A few months later a by-election was to be held at Mangaldai in which there were complaints about 70,000 illegal migrants figuring in the voter's list. The people got convinced that illegal migration on a colossal scale had been taking place and this sparked the anti-foreigner's movement in Assam. Government of India forced the 1983 election in Assam on the basis of a defective voters list. This was done on the plea that there was not enough time to revise the electoral rolls before the election. There was widespread violence during this agitation including the infamous massacre of 1700 Bengali Muslims at Nellie by the Lalung tribe. After years of a massive agitation, demanding detection, deletion and deportation of foreigners, the agitators reached a settlement with Government of India. Assam Accord was signed in 1985. Besides other issues agreed on, Assam Accord stipulated fencing of the border with Bangladesh, to prevent ingress of illegal migrants. A border fence may be a fool proof method of preventing infiltration but there is no better way of doing so. To be effective, border fencing has to be supplemented by vigorous patrolling and other measures. The motivating factors behind infiltration must be addressed. If this can be done successfully, then a permanent solution of the problem can be found. The decision to fence the border was taken in 1985 and reflected in Assam Accord but the work on fencing started seven years later in 1992. 13 years have elapsed since this Accord and fencing has not yet been completed. Whereas in Dhubri sector of Assam it is nearly complete, in the Cachar sector only a little over half has been completed. As against this, fencing in Punjab started in 1988 and was completed in 3 years by 1991. The quality of fencing in Punjab is superior. It is two feet taller. Observation towers and lighting of the fence have been provided in Punjab, all along the border. In Assam observation towers have been constructed in Dhubri sector only and there are none in Cachar sector. There is no lighting of the fence anywhere in Assam. The density of troops guarding the fence is higher in Punjab. A BSF battalion in Punjab holds a frontage of approximately 30 kilometres. In Assam, BSF Battalions in Dhubri sector are deployed over frontages of 70 kilometres and in Cachar sector over a frontage of 40 kilometers. Border fencing in Assam must be completed forthwith on a war footing. In terms of cost outlay, it may not now be possible to provide border fencing of the same height as in Punjab but there must be lighting arrangements for the fence. Observation towers must be provided in Cachar Sector. Additional BSF battalions should be provided in the East with each battalion having a frontage of 30 kilometres. It is understood that one reason for thin deployment of BSF in the East is the fact that 16 battalions are deployed on counter insurgency tasks. Such diversion of forces from border policing to other duties, when the battle against illegal migrants is on, cannot but have adverse effect. The shortage of BSF units must be made up on priority through new raising. The present arrangement of guarding the riverine border with some speed boats and out-broad fitted country boats, is not adequate. There is a need to have floating BOPs on medium watercraft with four to five speed boats attached to them. A proposal for nine medium crafts has been put up by DG BSF. This should be sanctioned soon. All country boats plying on the river near the border must be registered with their registration number marked on them and the registration papers available with the crew for verification, when required. Our nationals in the border districts and for that matter in the whole State, should be provided multipurpose photo identity card. This task should be completely on high priority. Effective arrangements must be made for registration of births and deaths in the State. The Brahmaputra is normally 5 to 7 Km wide and during floods has only one water channel. However, in lean season, there are two, three or even more water channels throwing up chars (river islands). Due to changing river configurations, it is difficult to survey the chars. The Bangladeshi Muslims settle on these chars. They are hardy and are prepared to face difficult living conditions, particularly when the chars gets submerged for a few days during floods, which come three to four times in a season. Chickens are put on roofs, cattle herded on platforms above the water level and in emergent situation men and cattle live in boats. This hardy community has been living on chars in the Brahmaputra from Dhubri (near the international border) to Lakhimpur. There are still several chars which are uninhabited. These should be handed over to the Forest Department and notified as forest land. Trees which can withstand 1 to 3 feet of water during the flood season should be planted on them. The measures recommended to arrest the influx of illegal migrants may not completely stop their ingress but will certainly go a long way in reducing it to a small trickle. A more lasting and effective solution can come about through economic development in Bangladesh. This will remove the motivation behind trans-border migration. Lately, there have been welcome developments in this regard in Bangladesh. There are signs of the economy picking up in that country through the unique experiment of Grameen Bank supported by a large amount of international funding and the efforts of the Government and other NGOs. The Grameen Bank has been targeting the women. Its membership has swelled to over 2 million, and of these, 93 per cent are women. It is providing micro-credit loans without any collateral. These run into several billions and they have a record recovery rate of 98 per cent. This is bringing about a perceptible change in the rural areas. Targeting women for economic development provides multi-benefits. It adds to the earning of the family, encourages gender justice, promotes women's education, which acts as a curb on population growth, and liberated women become bulwark against the spread of Islamic fundamentalism. All these benefits suit the interests of India. India should, as far as possible, be prepared to assist in socio-economic development of Bangladesh. The various measures recommended to stop illegal migration are non-controversial. No political party or organisation within the country can legitimately protest and demand that these steps should not be taken. Through these measures, we can bring about a sea change in the situation and trans-border migration will become a trickle. If we do not take effective measures to stop this movement and allow trans-border migration to continue unabated, then it may spell the doom of Assam and put our national security in grave jeopardy. Measures to stem illegal migration can be undertaken without any controversy but any alternation of status quo in regard to detection and deportation of these migrants will result in strident assertion of conflicting viewpoints. The "secular" parties and the minorities do not see any danger from illegal migration. They believe that most of the so called illegal migrants are Bengali speaking Indian Muslims and this issue has been unnecessarily blown out of proportion. They fear that in the garb of deporting foreigners, Indian Muslims will be harassed. Thus they are for the continuance of IMDT Act in its present form. On the other hand, the majority community of Assam and the political parties dubbed as "communal" by the "secularists" have a diametrically opposite viewpoint. They are gravely concerned about the large influx of illegal migrants and want their ingress stopped. They also want that the highly discriminating IMDT Act be repealed forthwith. There appears to be no meeting ground between these opposing views. Notwithstanding this, it is in our national interest to work out a mutually acceptable solution to this burning problem, which not only affects the people of Assam but the entire Nation. The furore raised over the attempt by Maharashtra Government to deport 34 Bangladeshis from Mumbai in accordance with the due process of law, underscored the sharp divide in the country over this issue. The ugly incidents in Calcutta, the stalling of the proceedings of the Parliament and the outraged feelings so strongly expressed in the Press, showed how sensitivities got aroused on this issue. In the past few years, many illegal migrants from different States, including Maharashtra, were being pushed back into Bangladesh - 4895 in 1993, 5782 in 1994, 3612 in 1995, 2791 in 1996, 4222 in 1997 and 1597 upto September 1998. In other words such deportation had been a common feature and no protests were being raised on that account. The point about Government of West Bengal not being given prior information does not hold much water. The deportation had to be effected by a central agency, the BSF. No doubt the illegal migrants escorted by Maharashtra Police had to transit through West Bengal but for that matter, they had also to transit through other States en route. On that basis, each State Government en route could ask for prior information of their deportation. It is pertinent that during the days of terrorism in Punjab, Policemen from that State had to come to Calcutta and had picked up suspected terrorists without any intimation to West Bengal Government. The protest made about that action was almost mute compared to what happened in the case of the attempted deportation of the Bangladeshis from Mumbai. Understandably there was sharp reaction in Bangladesh. The Bangladeshi Press was highly critical of the designs of the "Hindu fundamentalist Government" in India, trying to throw out innocent Indian Muslims and dump them in Bangladesh. One newspaper went to the extent of demanding that Bangladesh should seek assistance from the USA to deal with India. Prime Minister, Sheikh Haseena, a known friend of India, issued a statement that no Bangladeshi was illegally living in India. Her predecessor, not known to be so friendly towards India, had agreed to a Joint Working Group of India and Bangladesh to be set up for examining the issue of illegal migrants. This had implied acceptance of the existence of this problem, which was now being so summarily dismissed. International law does not provide for unilateral deportation in defiance of the views of the country to which the deportation is to take place. With the stand now taken by Bangladesh, it will not be possible for India to deport millions of illegal migrants to Bangladesh. From 1993 to September 1998, the BSF tried to hand over 39,746 illegal migrants to Bangladesh Rifles. The latter accepted only 9.253 and refused to accept 30.493. The acceptance figures by Bangladesh declined from 5799 in 1993 to only 55 in 1998 (upto 30 September). With the recent developments in the wake of the attempt to deport 34 Bangladeshi Muslims from Mumbai and the statement of the Prime Minister of Bangladesh, it is unlikely that Bangladesh Rifles will now accept Bangladeshi migrants. Moreover, the bursting population of Bangladesh creates a Malthusian nightmare and is not conducive to that country accepting them. Further, our capability to identify and deport over ten million such people is questionable. In these circumstances, deportation of these illegal migrants is not now a practical proposition. IMDT Act was enacted at the height of the anti-foreigner's movement in Assam. The large scale violence during the movement including the Nellie massacre, had led to understandable apprehension among the minorities of harassment and victimisation. A large number of illegal migrants had been pushed back in previous years. It is possible that in this process, some genuine Indian citizens had been harassed and pushed back. Be that as it may, the fact is that on the plea of protecting genuine Indian citizens, the IMDT Act was formulated but in practice, it has been found to be primarily serving the interests of the illegal migrants. was modified and now the complainant can be from the same police station area as the individual being complained against. The deposit fee has been reduced from Rs. 25 to Rs. l 0. The Police can also suo moto initiate action. Elaborate time consuming procedures have been laid down for screening, for examination by District Tribunals and for appeal to the Appellate Tribunal. Proponents of IMDT maintain that unwarranted fears have been aroused about the large influx of population from Bangladesh when in actual fact their number is very small. They want to retain this Act at all costs. They feel that otherwise, the minorities would face great hardship and harassment. The opponents of this Act demand its immediate repeal as it is a highly discriminatory legislation applying only to Assam and not to any other State. They argue that such a legislation should not have been on the statue of any sovereign State. It gives freedom to an alien to enter this country, secure in the knowledge that the country he has entered illegally, will have to prove that he is an illegal migrant to deny him citizenship. Under the Foreigners Act which applies to the rest of the country and which is in consonance with the practice followed the world over, it is for the foreigner to prove that he is an Indian national to claim Indian citizenship. The IMDT Act shifts the burden of proof on the complainant or the Police, to establish that the person complained against is a foreigner. the futility of continuing with the IMDT Act in its present form. The Tribunals have been starved of funds and resources. Out of 16 District Tribunals only 5 are functioning. The remaining 11 tribunals have only one person each on the bench and as such are non-functional. Salaries and TA bills of the staff are not paid in time. Essential facilities, like transport and telephone are lacking and funds are often not available to buy even postage stamps. The Border Organisation required to process these cases has been encountering difficulties at every step. Often by the time a complaint is received or the Police initiates inquiry against a suspect, that individual shifts to another location and is not traceable. When the individual is available, he insists he is an Indian national and while the Police tries to collect evidence, he often disappears. The process of absconding also occurs at two subsequent stages - before the case is heard by the Tribunal and during the 30 days period allowed to the person to appear to the higher tribunal or face expulsion. Under this Act, the Police does not have the powers of search, seizure or arrest as available under the Foreigners Act. During trial by Tribunals, prosecution witnesses do not appear because there is no provision for paying them their travelling expense. Any move to repeal the IMDT Act is likely to encounter strong opposition from the minorities and their supporters, for vested and opportunistic reasons. Some of these have begun to suggest that to remove the allegation of discrimination connected with this Act, its provisions should be extended to other States. They argue that the Foreigners Act of 1946 is a legacy of the British era and was meant to deal with foreign national who were ethnically and culturally different from Indians. The requirements for dealing with Bangladeshis who have ethnic, cultural, linguistic and religious affinities with our population, are different. This requires a different legislation. This line of argument ignores similarities between the Tamil people of Sri Lanka and of Tamil Nadu or for that matter, the similarities among the people living on either side of the Indo-Nepal border. It is further argued that the meagre number of foreigners detected under the IMDT Act is not due to any infirmities of this Act or in the procedures being followed, but due to the very small numbers of illegal migrants in the country. This argument flies in the face of all available statistics and other indicators, establishing the presence of a very large number of illegal Bangladeshi migrants in the country. be replaced by a more just, workable and fair enactment. The IMDT Act does not exclusively apply to any religious community. It is applicable as much to Bengali Hindus as to Bengali Muslims. Providing asylum to minorities fleeing from their home country was a Partition liability for both India and Pakistan. Yet in Assam no distinction has been made between Hindus and Muslims. Those migrants who came into Assam upto 24 March, 1971 have been given Indian citizenship, irrespective of the religious community to which they belong. However, the ground reality is that of late almost all the illegal migrants now coming into Assam are Muslims. Partition liability of India in relation to refugees from East Pakistan/Bangladesh is only in respect of the minority community of that country. However, this liability should not be extended beyond a reasonable time frame. A quarter of a century is adequate for this purpose. Any Hindu migrant coming to India after 24 March 1971 without valid papers should be classified as an illegal migrant. Although India had no Partition liability for East Pakistani Muslims, Assam Accord caters for Indian citizenship being granted to all East Pakistani Muslims who came across illegally between 15 August 1947 and 24 March 1971, with a special provision that those who came between 1 January 1966 and 24 March 1971 would be eligible for this, only after a lapse of ten years of being identified as foreigners. of Assam in 1991 comprises illegal migrants. Since deportation is being ruled out as a viable option, even those, whether Hindus or Muslims, who came in illegally after 24 March 1971, will now not be deported. Thus the scope for harassment gets considerably reduced and the main sting in the whole process gets taken out. political or otherwise, Magistrates from outside Assam be deputed for this task. The survey should be completed in a fixed time frame of a few months. Inducting Magistrates from outside will be on the lines of what happened in 1983 elections, when officers were brought into Assam from different States on temporary deputation. Individuals identified as illegal migrants should be allowed the right of appeal before Foreigners Tribunal set up under the Foreigners Act. This will provide necessary judicial sanctity to this exercise. The proposed arrangement should adequately assuage the legitimate fears of the minority community and will also be a humane measure for the illegal migrants. Pre-1971 illegal migrants stand already legitimised and the post-1971 illegal migrants, not now to be deported, will be partially legitimised. The minority community in Assam now comprises nearly 30% of the population and with their tendency to vote as a bloc, they can hardly be considered a minority, in real terms. They have come to acquire a decisive role in Assam's democratic polity, which the majority community with its split votes, cannot match. So far as the majority community is concerned, they may resent the decision not to deport the illegal migrants but in the present circumstances, there is no other alternative. They should get reconciled to it. Illegal migrants upto 24 March 1971 have been made Indian citizens and this has been accepted by them. Illegal migrants of post-24 March, 1971 vintage will not be deported but will be made Stateless citizens. The minority community should appreciate that the repeal of IMDT Act and its replacement by a just, fair, transparent and expeditious act will provide adequate safeguards against harassment and victimisation. This will also reduce political patronage for illegal migration and will be yet another disincentive for prospective illegal migrants. A silent and invidious invasion of Assam has been taking place for several decades and successive Governments have failed to stem this demographic onslaught. It started as a purely economic movement contributing to the development of Assam's agricultural economy. As Independence approached, it acquired communal and political contours. And today, an international dimension with security overtones has got added to this population movement. Hitherto the intrusion of illegal migrants has generally been looked upon as a local problem affecting only the people of Assam. The myopic view accounts for the more sinister and dangerous aspects being overlooked. The views expressed by Jinnah, Bhutto, Sheikh Mujib-ur-Rahman and the present day intellectuals in Bangladesh cannot be ignored. Assam can provide the much desired lebensraum for Bangladesh. This fact coupled with Assam's geostrategic importance, Bangladesh's bursting population and growing international Islamic fundamentalism, underscore the volatile situation created by this ongoing demographic intrusion from across the border. We must not allow any misconceived notions of secularism to blind us to these realities. Although Bangladeshi illegal migrants have come into several States of India and they are more numerous in West Bengal than in Assam, they pose a much greater threat in Assam than in any other State. If not effectively checked, they may swamp the Assamese people and may sever the North East land mass from the rest of India. This will lead to disastrous strategic and economic results. Political parties have been underplaying the grave importance of this problem and have been viewing it as something affecting only the Assamese people. Thus an issue of great concern for national security has been made into a partisan affair and a matter of vote banks. It must be lifted above the mire of party politics and viewed as a national security issue of great importance. There is an imperative need to evolve a national consensus on this all important threat facing the Nation. Concrete steps must be taken on war footing to ensure that the borders are as nearly sealed as possible and the unabated flood of infiltration, reduced to a trickle. Concurrently, the highly discriminatory IMDT Act which during the last 15 years has proved to be an exercise in futility, should be repealed. With deportation of illegal migrants to Bangladesh no longer a viable option, a new legislation needs to be introduced which will ensure a just, fair, practical and expeditions approach to detecting illegal migrants and declaring them Stateless citizens without voting rights, and without the right to acquire immovable property. A summary of recommendations is attached as an appendix to this report. Awareness should be promoted about illegal migration into Assam being not only a threat to the identity of the Assamese people but what is more, being a grave threat to our national security. Border fencing in Assam should be completed on a war footing. Observation towers and lighting should be provided on the same scale as in Punjab. BSF battalions deployed in Assam should not be given responsibility to hold unduly extended frontages. As in the case of Punjab, BSF battalions should hold a frontage of 30 kilometers. Additional BSF battalions should be provided for this purpose. Diversion of BSF battalions from the border in Assam for other tasks, when the battle against infiltrators is on, must be scrupulously avoided. All country boats, plying in the river near the border should be registered and their registration numbers marked on them. Medium crafts for floating BOPs with adequate speed boats for the riverine sector, should be made available as early as possible. Multi-purpose photo identity cards should be provided to all our nationals. Districts bordering Bangladesh should be accorded higher priority. Effective arrangements should be made for registration of births and deaths. The National Register of Citizens should be updated and computerised. A separate register of Stateless citizens should also be maintained. Vacant Chars in the river should be handed over to the Forest Department and trees planted on them. As far as possible, we should assist in the process of economic development in Bangladesh. Socio-economic programmes designed to improve the lot of women should be given priority due to its multiple beneficiary spin offs - improving the family's income, women's education curbing population growth and educated women becoming a bulwark against the spread of Islamic fundamentalism. Hindu illegal migrants who have infiltrated after 24 March 1971 should not be given refugee status. They should be treated as illegal migrants. While maximum effort must be made to stem the ingress of illegal migrants, those who have already infiltrated after 24 March 1971 to date, may not be deported. The IMDT Act should be repealed and replaced by a new legislation which should provide for detection for illegal migrants in a just, fair and expeditious manner, with due judicial sanctity accorded to the process. Those identified as illegal migrants should be allowed to stay in the country as Stateless citizens with no voting right nor the right to acquire immovable property. Survey teams working under Magistrates on deputation from other States assisted by policemen of Border Organisation, should identify illegal migrants in a fixed time frame of short duration. Those identified as foreigners by these teams should be given the right of appeal to tribunals set up under Foreigners Act.